China's cultural industries will gain new momentum from a government nudge meant to give new oomph to the country's economy and soft power. 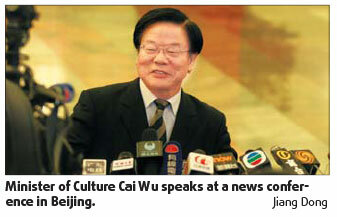 China's Minister of Culture Cai Wu announced on Monday afternoon that his ministry will soon carry out The Guidelines for the Promotion of Culture Industries, which was passed by the State Council on July 22, 2009. It's the 11th industry rejuvenation plan issued by the State Council after the textile, light industry and motor sectors. Cai says people from cultural fields have long anticipated the development plan. "Since the global economic downturn the government has included cultural industries in its economic development strategy, because rejuvenating the industry is an inexorable and long-term method to strengthen China's soft power and cultural influence in the world," Cai says. The minister says the development of cultural industries would revamp the country's entire economic structure. "Cultural industries create many jobs and use fewer natural sources but produce more added value," he explains. "In the first quarter of 2009, the growth rate of China's cultural industry was higher than 17 percent, which is 6 percent to 8 percent more than the concurrent GDP growth rate," Cai says. "That means cultural industries have constantly contributed to the country's economic growth, and demand for cultural products has been increasing." The ministry is working on a national network of public cultural services to satisfy this growing need. With more of the country's money and effort being funneled toward cultural undertakings, the rapid construction of cultural infrastructure has enjoyed tremendous nationwide support. This has forged an extensive public cultural service network covering both urban and rural areas. When New China was founded in 1949, the country had 55 libraries, 896 cultural centers and 21 museums. But a lot has changed in this realm through 60 years of development, particularly since the 30 years of reform and opening up. Today, there are 2,820 public libraries, 3,218 cultural centers and 1,893 museums. Most counties have at least one library and one cultural center. Township cultural centers and village or community culture rooms have respectively increased in numbers from none in 1949 to 4,107 and 247,332, respectively, by the end of 2008. Since the Ministry of Culture issued a circular entitled Recommendations on the Deepening of Reform on State-owned Cultural and Performance Troupes early this year, 77 State-owned performing arts troupes have transformed into companies, and another 59 provincial troupes will soon begin their experimental transformation. Private cultural companies have also developed very rapidly. These include firms such as Shanghai Shengda Internet Development Co Ltd and Yunnan Lishui Jinsha Performing Arts Co Ltd. It also includes a number of famous original cultural projects, such as the Impression Series shows directed by celebrated dynamo Zhang Yimou and the popular animation Pleasant Sheep and Big, Big Wolf. The Ministry of Culture also supports the establishment four national-level model zones and 137 national-level model bases of cultural industry. Using methods employed in the economic reform, the government encourages private capital, foreign capital and risk investment. Both private and State-run cultural enterprises, such as TV and film studios, entertainment agencies and record companies, would enjoy the same treatment, the minister says.